"Children of Gimblax" -- You must hunt down and kill the goblin Gimblax in Stillmoon. #DanieltLyons, Posted: Apr 09 2005 at 5:16 AM, Rating: Sub-Default, (Expand Post) would someone be so kind as to tell me where to find the wayfayer Mercenaries ? would someone be so kind as to tell me where to find the wayfayer Mercenaries ? So I started doing good side faction with my necro (a dark elf, too) and am about a dozen or so missions and a handful of tasks (6-7?) into dubious. How many more missions should I expect to do before I can finally hit indifferent and start on my progression? Get your faction back and you should have the ability restored. I just done this mission tier1..should get ability: "Gift of the Keepers" but Chieftain Relae Aderi said :" you will fast lose it should you ever aid thd Dark Reign-- in fact it will disappear instantly"
yes,i ever silly to do a solo task aid Dark Reign. only once. did i forever lose this abillty or have some remedy method?? 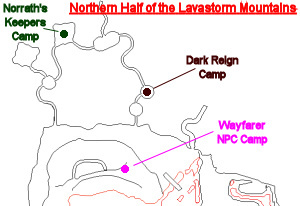 The Norrath's Keepers camp can be found in the Lavastorm Mountains tunnels leading to The Bloodfields. How many tasks does it take to get to indiff faction? And also, who are the good and who are the bad faction mercenaries that you talk to at the camp in the middle of Lavastorm? I have done all the way up to Emoush and have recieved both "Gift of the Keepers" and "Valor of the Keepers". I am at Warmly faction. I can't recieve the next 3 tasks for some reason. Only thing I can think of is there is a level requirement as I am 66. Any input? I got to the point where I needed the gimblax mission to finish off the gift of the keepers part, now the interesting part is before I got the mission I hailed the chief and recieved the 2 AAs and the Gift of the Keepers AA. Before I had even started the faction quests I had done a couple of the gimblax missions with some friends so it seems I got credit for them even though I wasnt at that stage in progression. in the kill the kirin quest. Where are these Kirin located? the only one I was able to find was in the same caves as the pumas (thru stillmoon temple) and it was a Kirin Student. Or if you can make it all the way to the top of the Ascent there are about 4 spawns up there. One by itself and 3 more very close together. There is a camp of two kirins in the second half of the zone, click on the gates and the end of the first tunnel to get there. The kirins are about 20 or so mobs deep. Setup camp a bit before them and keep killing until you're complete. Respawn is pretty quick there. I found I can invis past most mobs to get to them. Some see invis can be avoided. I do have one question.. is the list complete. ie, is there nothing that "opens up" and becomes available at a cost greater than 340 crystals? I point to the LDoN merchant list as precedent - it cannot be viewed fully until you have built up enough points. The reason I ask is that someone told me that there were augments available with better stats than I see on the list. And someone else said that the most expensive item cost 1800 crystals. I just completed the three tasks (good side) for tier two, and am able to get both the mission (Sickness of the Spirit) and the raid (Calling Emoush). Do I have to do the mission for the reward if I already have the turnin from Emoush? Found out myself. When turning in the stone before completing the mission, you get a character flag. No reward. ....I am at this point, amiable faction but Nylaen won't give me these tasks, just keeps giving me this one liner msg. You need to follow prompts from Chieftain Relae Aderi, until he tells you to speak to the Private again. Then go talk to the Private. You'll find them atop of mtn. to Nagafen's lair at p2270,n65. But the solo quests i missing something there. It took me (62war) and my 61druid just to do the 8 lavaspider silk collection quest for the Good progression. I'm still scouting the layout and looking for post on the other quest that i noticed the mobs are a lil higher in lvl and harder to to grab w/o adds. On my first and only task my standings went from apprehensively to dubious with the Evil camp but stayed apprehensively with the good. Will you have to complete all 4 task to move up to indifferent with either camp your working for? Upon reaching indifferent faction, you are able to do more advanced missions for the good side.. Upon completing these tasks, speak with Chieftain Relae Aderi, and then to Keeper Dilar Nelune. You will receive a single-group task. Upon completion of this task, speak with Chieftain Relae Aderi to receive two AAs and a new ability: "Gift of the Keepers" -- a maximum stats increase of 10 per stat. actually you don't need to be level 70 you need an average group level of 68plus though. Not sure if the non 70 people get the gift though but did play with who was in group to get mission. I just did this mission this week as a 69 chanter. I received the reward and can get the mission for Gimblax. However, I cannot get the next 3 solo missions - not sure if this is a faction thing (indiff atm) or level. They are still offering Gimblax, even though I've already received the reward for killing him. Amiable faction should get the next three solo missions. If I recall correctly, three more group mission wins will raise your faction from indifferent to amiable. There may be an easier route, but this worked for us. "Upon completing these tasks, you receive a number of Radiant Crystals (droppable and used to purchase items from Tatsujiro the Serene) and a Norrath's Keepers Token. The Token can be turned in to Wayfarers Mercenary Youra for the following faction hits: "
I have done 4 tasks so far, and have yet to receive one crystal or a token. The only thing these tasks give is some minimal coin, and the faction hits. I got a mission one time, where the crystals were a reward, but I thought missions and tasks were different. These Goblin Warlord's Beads drop from a stillmoon warlord. You get the mission "Trial of Perseverance" at Ekiltu Verlor. Unfortunately I miss a screenshot with the exact steps of this mission. a Stillmoon warlord's corpse mutters an ancient curse as you end his life. Your task 'Trial of Perseverance' has been updated. Beyond the wildest dreams and plans of the creatures that call Stillmoon their home, you have defeated the Trial of Perseverance and bested them all! You have gained 13 Radiant Crystals. In our last fight he dropped his beads and the Bracer of the Warriors. Ju'rek the Corrupted and Diseased Wing Fragments. Yeh this blows - I can so use the other 4 unused ones atm but guess 1 more is better then none.